Whatever you take, museums are a vital part of our cultural heritage and help anchor us to our past or assist us in understanding the past of those with belief systems outside of our own. For that reason, they should and must be preserved. So, it’s not hard to gather that I love museums. I grew up in Dover, Kent and we had a lovely if slightly bizarre museum. It was one of the oldest in Kent being founded in 1836. Originally, the town museum was situated in the Market Square, well within the range of the cross-channel guns during World War II. It was decided to move it to some rooms under the Maison Dieu – Dover’s Town Hall. And there it stayed until 1991 when it was moved back to its original spot. From an inconspicuous door off the side of the building, one was led into an Old Curiosity Shop of wonders. The first exhibit to greet the visitor was a polar bear – its teeth bared, paw upraised as if ready to slice down and eviscerate its prey. It was my favourite thing in the whole place. The poor creature was brought back from the Arctic in 1897 by explorer and local doctor Reginald Koettlitz. Its paw is not raised in attack but to hold a lamp! 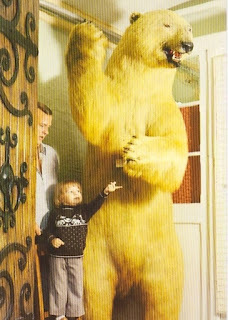 The bear stood in the surgery of the Koettlitz family from 1890 to 1960. My mother liked to find an excuse to visit the surgery, just to see the bear. There was limited floor space within and so every nook and cranny was utilised in a way that would probably give today’s museum professional a fit of the vapours but for a child, it was exciting and wondrous. Unlike today’s modern and often minimalist approach to displays, Dover Museum, at that time had no definite layout or sequencing. It was as if things had been randomly housed with speed, anticipating a temporary solution to the problem. Which, I should imagine it very much was but over the years nobody altered this and that was the key to its fascination; it was as if time just stood still. The move back to its original site in 1991 heralded a new era for Dover Museum but I think, if I were given the option, I’d like to see the cosy, strange little room of my childhood, just one more time. It was there that my love of history and archaeology was born. The question, therefore, must arise – why do we choose to house these artefacts at all, and what value do we derive from them? Are they merely passing curiosities or do we connect with them on a deeper, visceral level? Collecting objects from the past is nothing new – archaeology has shown us countless examples of an object from one era, even from millennia before, being appropriated long after its original purpose has past. As I’ve grown older, I’ve come to appreciate more, the artefact not as a tangible representation of the past but its intrinsic value as something that someone once owned or even cherished. All objects, even the cheap as chips items we buy from the pound store, are created for a purpose but whether we adopt that usage or turn it into something else cannot be defined with the passage of time. In my latest novel HIGH SPIRITS, Alec, who was the assistant curator at the fictional Partridge Hall, is finding the evolution of museums and displays a struggle, even though he has had seventy-something years to acclimatise himself to these changes. The acceleration of change would have been noticeable to him over the last thirty or so years when museums began to rely more and more on available funding streams and ideas about how artefacts should be mounted and grouped have progressed. For Alec, the museum was a place of hushed learning where the focus was ‘inward’ towards the work of the curator. This was a world into which the general public ‘the outward’ would be welcome but kept at arm’s length. From reading the words of men who would have been contemporary to Alec were he a real person; one gets the sense of a gentleman’s club rather than a service being provided for the viewing public. The museum was their passion and they were indulging in that at the very best level. I recall visiting Dover Museum with a friend as a pre-teen and the curator allowing us to view the entomology collection that was housed in heavily polished dark wood drawers. It would never occur to us to just open the drawers, which were standing in full view in the middle of the room, and take a look. No, we waited and were shown. A very different norm from today where visitors are positively encouraged to open, prod, pull and explore things through dressing up boxes and interactive activities. It used to be common practice for the accession number – that is, the number given to an object upon its donation to the museum – to be marked on the small cards that accompanied the artefact into the display case. These days, most museums have done away with this as being irrelevant to the visitor experience. Alec finds this outrageous! Alec was hovering by the Roman pottery case tutting to himself about the labels that had recently been added. “How is anybody supposed to understand anything these days,” he muttered. Jean knew exactly what the problem was, but she enjoyed pushing Alec’s buttons. It was the only bit of amusement she got these days. For the best part of 13 years I worked for the Colchester and Ipswich Museum Service and for the last few years before I left I had the good fortune to be able to transfer over to the curatorial side of the museum working first as a Curatorial Assistant in the Collections Office and then as a Project Assistant, both on secondment. Both these roles gave me unprecedented access to the collections and how to manage and look after them. I learned how to accession objects into the collection, mark them correctly, correct storage methods and how to display them. The storerooms of Colchester Museums contain one of the most significant collections of Roman archaeology outside of London as well as an outstanding collection of costumes and accessories, natural history and post-medieval (social history)artefacts. It was to these stores and the objects contained in them, that my mind turned when describing the workings of Bethan Andrews’s world and how Alec’s was so very different. In what was the office of the Documentations Officer sat many old, metal card files. On each postcard sized card was carefully typed the object name, sometimes the dimensions, occasionally excavation details, or from which collection they were derived (this was the time of the gentleman collectors upon whose generosity many provincial museums were founded). Alec would have been very familiar with these gentlemen and probably dined out with them frequently at the Old Coach House. If Alec could’ve, he’d have passed out with the shock of finding a female curator. In his day, he oft-told Jean (who wished she could put her fingers in her ears and say ‘lalalala’), women were allowed to organise the little shop that sold postcards but never, never were they allowed to be involved in actual ‘curation’. No, that was a man’s world. The joy of academia. Of sitting in one’s office, smoking a pipe and mulling over a particular archaeological conundrum. Women had funny ideas about how things should be done, and they most certainly didn’t involve evenings in the room above the Old Coach House, where the local dignitaries gathered for a hearty meal and putting the world to rights. Many a promise of money for this repair or that case had been made by Alec glad-handing the likes of the Hedge or Morgan patriarchs. The town had been built on personal enterprise and that always but always went hand-in-hand with cultural philanthropy. Of course, these days, the museum services have the use of a bespoke database on which to record all their artefacts and, although the cards were kept by the Documentations Officer, they were a fall back reference as a last resort, having little or nothing to tell (Quote about knowing where everything was). Today, museums are no longer ‘inward’ but very much ‘outward’ focusing on being seen as less elite and more accessible with displays that make the collections relatable. It was quite natural to find groups of noisy children, roaming the galleries with dog-eared workbooks, their supervisor in tow, trying to get them to focus. Being more child or family-focused sits well within frameworks around funding. No longer is it the case of simply opening the door at 10 am and waiting for the world to wander in. Whole industries and specialists have sprung up around the heritage sector, to advise on demographics and to isolate what particular group is being left out. This gives rise to focus groups which in turn lead to workshopping. Nowadays, from what Alec could gather, they had meetings with ‘stakeholders’ and were given ‘relationship managers’ from government-funded bodies, who talked in a whole new language about such things as ‘early adopters’ and ‘twilight subsistence’. Museums had developed in a whole new way, and he didn’t like it one bit. “How is that any way to do business?” Alec would grumble as the next suit passed through the door and ‘hummed’ and ‘hawed’ and went away with the promise that if the bid was good enough, the money would be forthcoming. Jean would listen with ever decreasing patience to his moaning, and when she couldn’t stand it any longer, she would retreat to another part of the Hall and let him sulk in peace. In HIGH SPIRITS I’ve tried to relay how Alec feels about his beloved museum, the changes he sees and the sense of frustration he feels. He is stuck at thirty-years-old and 1944, at a time when things were so very different but around him, the world keeps changing and moving forward. I empathise with him, in many respects. The museum of my childhood has long (and quite rightly so) gone. Wandering the galleries at Colchester, I would see children darting around, seeing but not seeing these amazing artefacts and I would wonder why they didn’t experience the same sense of fascination that I did in that one large room under the Town Hall of Dover.